Deploying an EJB2.1 Stateful bean is quite very easy in weblogic. First of all develop the Stateful bean and extract a jar out of it. I will show how to build and deploy the EJB in web logic 10.3 step by step. There are five steps involved in EJB Session bean Development and deploy process. 1. Create a Home Interface. Below is the list of some high Level rules which we have ensure while developing the EJB objects. 3. The name of create method must begin with create e.g createClientPortfolio etc. 5. Create method should throw “CreateException, RemoteException”. 2. In case of Stateless session bean there must be only one create method and that should must prefix with “ejbCreate”. And should be with no-arg approach. 3. Every bean should save the SessionContext copy in the “setSessionContext” method, as this bean called only once when bean gets created; saving this reference is always useful. 4. Incase of Stateful session bean, do not need to have no-arg create method. And also you can create as many as createMethod. e.g ejbCreate(), ejbCreate(String), createCustomerPortfolio(String) etc. As we are deploying on weblogic , we need weblogic-ejb-jar.xml so that weblogic can treat this as an EJB Component and set the configuration at deploy time(JNDI name, security related etc). jndi-name: this is the name of the JNDI given the EJB component. To deploy simply extract the jar of the EJB classes and deploy in the admin console of weblogic. In case of stateless, keep everything same and change the bean create method to no-arg. HermesJMS is an extensible console that helps you interact with JMS providers making it easy to browse or search queues and topics, copy messages around and delete them. It fully integrates with JNDI letting you discover administered objects stored, create JMS sessions from the connection factories and use any destinations found. Many providers include a plugin that uses the native API to do non-JMS things like getting queue depths (and other statistics) or finding queue and topic names. The main advantage of the tool is the ability to work with many JMS Providers like JBOSS MQ, ActiveMQ, OpenJMS, Weblogic, Webspehere etc etc. It also supports the FIX protocol messages which gives a full advantage to all financial vertical applications. HermesJMS is a java swing based tool. Follow the below steps to install and use the tool to monitor the JMS resources. 2. Open Command Console and type the below command to run the execuatable installer jar. now it will start the installation process. Follow the installation wizard and finsh. 4 Now it will open the GUI of HermesJMS. -> First of all click on Provider Tab and add Weblogic jar. 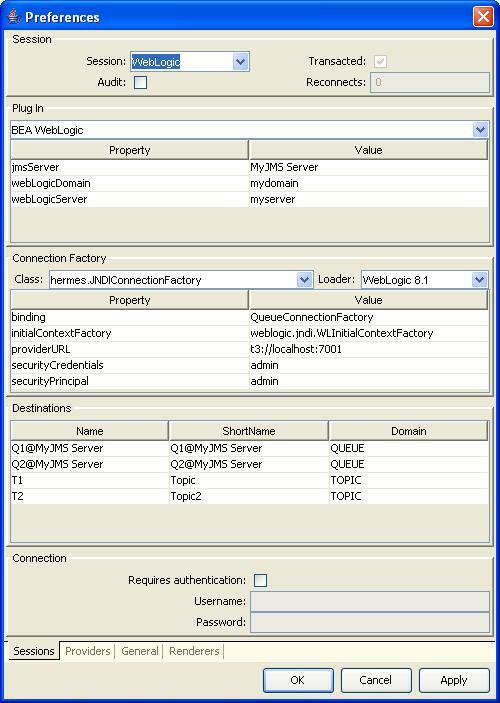 -> On Connection Factory drop down, select the hermes.JNDIConnectionFactory class and also select the loader “weblogic“, And then add the properties of the Connection factory. This is mandatory to discover the JMS resources of the selected provider. Now close the dialog box. -> On the left side right click on your “weblogic” session and click “discover“. You get a meesage to add the resources into the session click “yes”. -> now you will see all the topics and queues beaneth your cofigured session. Right click on any the resource and click “Browse”, you will notice the message details on the right side. You can also view the configuration on the HermesJSM website. Web Service: A web service is a service which runs over XML Data exchange in the form of SOAP Request and SOAP Response. The advantage we got over web service is the communication with different language platforms e.g. Java, .net, C++, PHP etc. Web services are playing a crucial part in SOA (Service Oriented Architecture) which is again a very broad term and one of the successful architecture accepted by many enterprise level applications today. Let’s end the definition part here and move now to Web Service development part. (Hope the intro have made you clear the basic concept of Web Services if not please do Google more on web services 🙂 ). To develop a web service there are 2 types of approaches we can follow. Contract First Approach: This approach works on the basis of WSDL, and require a very good knowledge of WSDL, XML, XSD. Once you expertise the web services then you can apply some hand on this approach. For this post I will describe how to build a web service using 2nd Approach. This approach starts with the very core level of code writing. I mean by writing a Java Class and defining all the properties of web services i.e. ports, operation, endpoints etc. Lets Develop a Ping Web Service: This web service will simply return a greeting message with Current date and time. targetNamespace: Define a namespace for your web service, if no name specified, Compiler will take a default name space in the reverse order of you package name. parameterStyle =defines how Web service request/reply messages are interpreted by a Web service provider/consumer. Quite simply, "wrapper" style tells the Web service provider that the root element of the message (also called "wrapper element") represents the name of the operation and it is not part of the payload. This also means that children of the root element must map directly to parameters of the operation's signature. The "non-wrapper" style (also sometimes called "bare"), does not make this assumption; in this case the entire message will be passed to the service operation. The reply message is handled in a similar way. in case if you are passing any arguments to the web service method. You can use @WebParam(name=”argumentName”) annotation to comply with the schema. Otherwise generic “in0”, “in1” names will be used in WSDL for input arguments. Now we need to create the artifacts of the web services. There is tool called WSGEN, This tools reads the Service Endpoint interface and generate the WSDL and XML Schema for the web service which needs to be published. To Run the tool first of all compile the Web service which we have created above. And open the command console and move the compiled directory e.g “/bin” dir. And run the below command. Once you run the tool you will notice the creation of WSDL and XDS creation in the “/bin” directory. Now Let’s publish the Web Service. In this part we will use the EndPoint class to publish the web service using a lightweight web server. Call the publish method to publish the web service using FQN of the web service URL and the Service endpoint interface. If you are able to see the WSDL, Time to cheer!!!!! now… As the Web service has been published successfully. [Note] Quit the Publisher Class to stop that Lightweight Web Server. I will explain how to write a web service client to test the web service in my Next Post. Please give your suggestions or feedback. In this article I will show how to unmarshall XML string using JAXB, Usually JAXB uses InputStreams and OutputStreams for the XML text input and output, respectively. One of workaround by passing a ByteArrayInputStreams (java.io) or ByteArrayOutputStreams (java.io) for XML String or Using StreamSource to read the input via StringReader. You can simply read my previous article “Sample on JAXB” to get the complete instruction on building a sample project on JAXB with eclipse plugin. Below is the method which we can use to perform the unmarshalling of XML String into Java JAXB objects. [NOTE] This example is totally based on my previous article “Sample on JAXB”. Simply add the above method/statements if your building the project on my previous article instructions. Even there are many ways to do the same thing mentioned in the article. please go through with the below URL. Click the Servers node to expand it and expose the names of the servers currently being administered through the console. Click the name of the server whose JNDI tree you want to view. Click the “View JNDI Tree” link. The JNDI tree will appear in a new browser window. You can click on an individual object name to view information about its bind name and hash code. [Note] Sometime we face issues like JNDI NameNotFound, in that case try to re-target the JNDI resource on the Admin server or Managed Nodes on Weblogic. Sometime we face issues with the application where some of the Jsp/servlets try to access the resources using getRealPath of the ServletContext class. The problem is that it works only when you explode the war file. Even there is a CR CR299135 for the weblogic 10+ versions to tackle this issue. You have to configure the <show-archived-real-path-enabled> flag to let weblogic returns the actual path of the application. This configuration can be applied 2 ways.